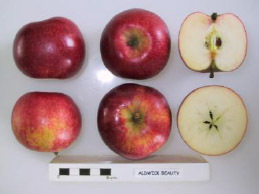 The Aldwick Beauty was grown originally by Mrs DM Alford, Aldwick, Bognor Regis and assessed by the National Fruit Trials in 1969. It is currently cultivated as part of Brighton Permaculture Trust’s National Collection in Stanmer Park, Brighton. You can see an Aldwick Beauty apple tree (planted 2010) in Home Farm Orchard, Stanmer Park ( map). The fruit is flushed red and becomes sweet by late August, but can be dry. This tree would be need to be pollinated by another tree flowering F13 – F20. The Aldwick Beauty is self-sterile and requires a pollination partner.